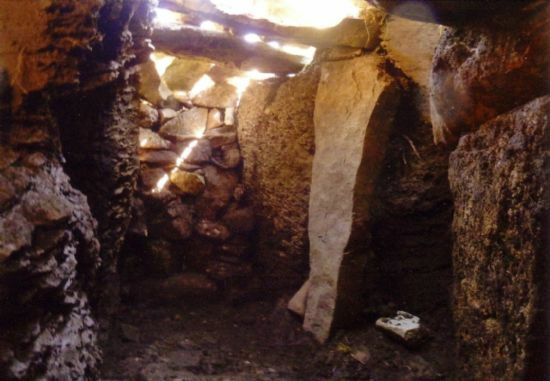 This well-preserved underground structure known as a souterrain was found on the island of Raasay off Skye. Souterrains are underground structures, sometimes termed ‘earth houses’. In the Highlands, they are found primarily in Caithness, Sutherland and on Skye, and date to the Iron Age, generally dating to the first centuries A.D. The reasons for their construction are debated, with storage, religious use or safekeeping of animals or people most often cited. Most are simple in plan with a single entrance, but a few have side chambers, including the unusual souterrain at Kirkton near Golspie. Few souterrains have any finds within them, though traces of grain appear in some. There are numerous souterrains on Skye, and a number have been excavated, providing some of our best information for the Highlands. The souterrain at Tungadale on Skye had a direct link with a nearby homestead, which unusually for this period was rectangular in outline, not a round house. Finds from southern Skye souterrains include quern stones for grinding grain and loom weights. This site was researched as part of ARCH’s Community Timeline programme in the Stop, Look and Listen project at sessions held in Broadford.